This is the sixth in a series of articles giving brief biographical sketches of the people who owned the Wanstead estate over 800 years. Links are given to sources of additional information on this site and elsewhere. Before his death in 1606, the Earl of Devonshire settled the manors of Wanstead and Stonehall on Mountjoy Blount (c.1597-1666), his eldest son by Penelope Devereux. Mountjoy’s illegitimacy meant that he could not inherit his father’s titles, but it did not prove to be a great handicap to his career as a courtier, official and soldier. King James I, who had succeeded Elizabeth in 1603, was a frequent visitor to Wanstead from the beginning of Mountjoy Blount’s tenure in 1607. Mountjoy Blount was to be raised to the Peerage in his own right, successively as Baron Mountjoy in the Irish peerage (1617), Baron Mountjoy of Thurveston in the English peerage (1627) and Earl of Newport (1628). It appears that Wanstead was the price he paid for the first of these titles. George Villiers, Marquess (later Duke) of Buckingham (1592-1628), was the influential but widely unpopular favourite of King James I and his son Charles I. He acquired Wanstead from Mountjoy Blount in the winter of 1617-18, reportedly to smooth the latter’s path to ennoblement. Buckingham does not seem to have wanted Wanstead for himself, and sold it only about a year later, in 1619, to his protégé Sir Henry Mildmay (1593-1664). It seems likely that Mildmay’s purchase of the Wanstead estate was part of a carefully choreographed chain of transactions designed both for the material benefit of Buckingham and Mildmay, and to cement links between them. 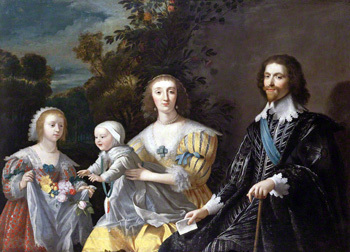 Though from an established family, Mildmay’s acquisition of the great house and estate at Wanstead was only made possible by his marriage to Ann Halliday, also in 1619, which brought him a substantial dowry. Ann’s father, William Holliday, had consented to the match only after "long and ernest sollicitation" by Buckingham, who was acting on instructions from King James. Interestingly, in view of the Child family’s later links with the East India Company, Holliday was also involved with it, and his cousin Sir Leonard had been a founding member. Elected as a director in 1616, Holliday became Governor in 1621. Mildmay was knighted by King James I in 1617 and held various offices at Court. He was a Member of Parliament variously for Maldon and Westbury between 1620 and 1660. Despite his links with the Court, Mildmay's religious views led him to support Parliament during the civil wars. In 1649, he was nominated a member of the High Court of Justice set up to try Charles I. Though not very active, he was present at the King’s trial on several occasions and later served a member of the Councils of State between 1649 and 1652. 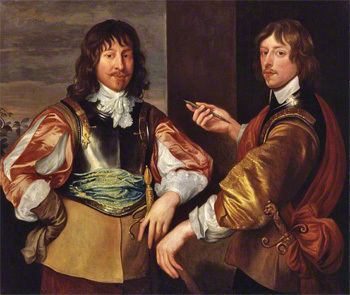 Mildmay retired from public life after the establishment of Cromwell's Protectorate in 1653. Following the Restoration of Charles II in 1660, Mildmay was initially called on to account for the Crown Jewels, which had been in his custody as Master of the King's Jewel House. Mildmay's response was to attempt escape as, following the establishment of the Commonwealth in 1649, most of the coronation regalia (some of which dated back to the Saxon period) had been melted down or dispersed. Quickly recaptured, Mildmay was charged as a regicide. At his trial, Mildmay's argument that he had sought to save the late King’s life was rejected. He was found guilty, stripped of his knighthood and estates, and sentenced to life imprisonment. Also, on each anniversary of the death of Charles I, Mildmay was condemned to walk from his prison to the gallows with a rope round his neck as a punishment for sitting in judgment on that monarch. The relative harshness with which he was treated was probably a reflection of his perceived disloyalty to the Royal Family, whose favour had brought him both wealth and position. In March 1664 Mildmay, along with other state prisoners, was ordered to be transported to Tangier. This was because the Government was nervous of prominent figures from the Commonwealth and Protectorate regimes maintaining contact with sympathetic elements outside. However, by now in his late sixties, he died before the order could be carried out. In the meantime, Wanstead had changed hands twice. Following the Restoration, the King’s younger brother James, Duke of York (1633-1701), profited greatly from the forfeiture of estates which had belonged to regicides and other persons exempted from the Act of Free and General Pardon, Indemnity and Oblivion. Granted the Wanstead estate in September 1661, James (later to become King James II and VII) sold it within a few months to Sir Robert Brooke, Sir Henry Mildmay’s son-in-law. 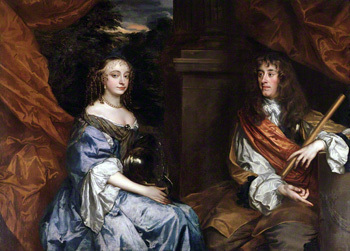 Anne Hyde, Duchess of York, and James, Duke of York (later King James II and VII), by Sir Peter Lely. Image © National Portrait Gallery, London. Sir Robert Brooke (c.1637-1669) was a very active Member of Parliament (for Aldeburgh, in Suffolk) from 1660 until the point, in the late 1660s, where he felt obliged to retire to France “upon the distress of his affairs”. He mysteriously drowned while bathing in the River Rhône at Avignon (some sources say Lyon) in June 1669. Brooke’s Suffolk property eventually passed to his nephew Sir Charles Blois. However, in 1673 Wanstead was sold by his trustees to Josiah Child, who had already been living there as a tenant for several years, for £11,500. For further information on Sir Henry Mildmay see History of Parliament Online. For further information on Sir Robert Brooke, see History of Parliament Online.